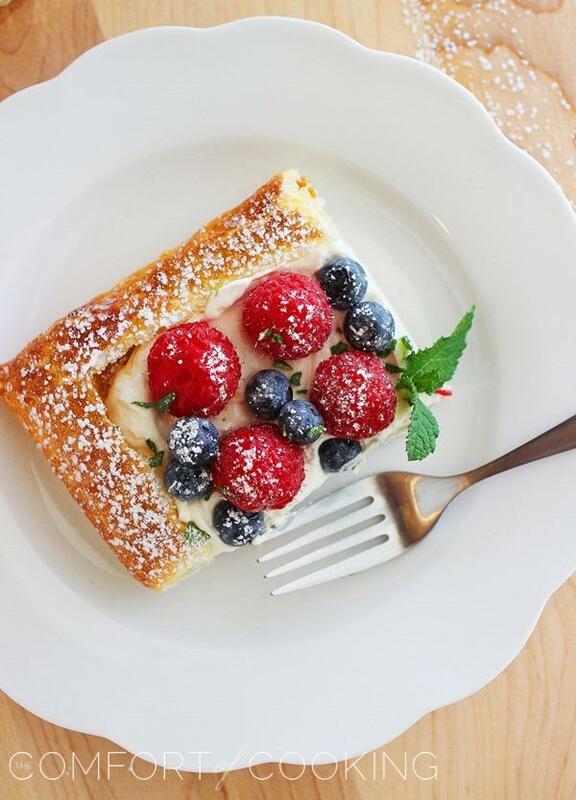 This light, lemony tart with fresh berries is festive enough for your July 4th party or any summer occasion! 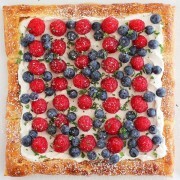 Should I have gone all Martha Stewart on this tart and patterned the fruit into a flag? Probably. ‘Round here, we’re all about no fuss, though! Cute little berry flags are fussy and meant for magazines. Totally adorbs and festive, but so much fuss. 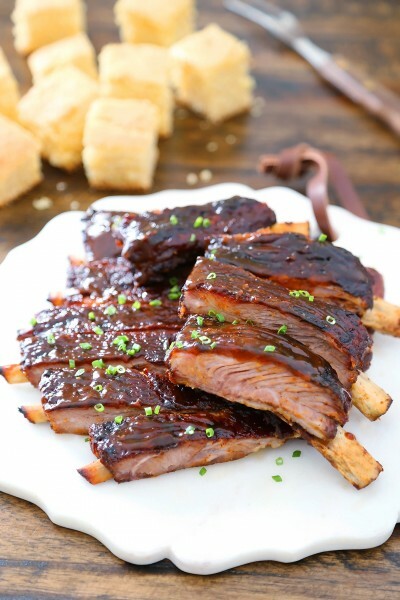 And, when you’re sweating through the summer heat and just need something quick to bring to a BBQ, time to make it frilly and perfect ain’t on your side. What’s your favorite summer berry? Mine has gotta be the raspberry. 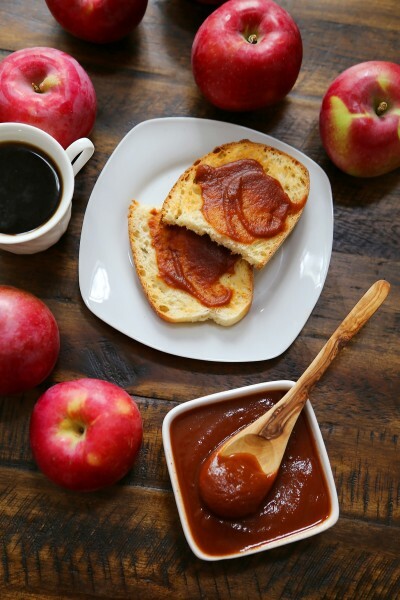 They have the prettiest ruby red color, are juicy as candy, and make a darlin’ decorative touch to any dessert. I never used to think much of them, but my hubby got me hooked! Now I am obsessed. Raspberries + prosecco + lemon complete my summer. Prosecco has nothing to do with this recipe. But, I think any recipe with “summer” in the title deserves a Prosecco mention. Am I right? So, let’s talk tart. I wish we could sit down to a slice (or three) together and chat about the weekend. Instead, though, I hope you’ll make it for yourself and whoever’s lucky enough to enjoy it with you! Making this little beauty is easy as pie. Or, actually, easier! Just roll out your puff pastry, pre-bake it and then let it cool. Mix up Cool Whip, cream cheese and lemon zest, and smooth it over the top of the golden brown pastry. Then, dot your favorite berries on top. Sprinkle with powdered sugar and a little chopped mint, if you’re feelin’ fancy. This tart is terrifically easy and colorful enough for any July 4th party. Or, just try it for any of your summer festivities! One batch makes enough for 12 hungry partygoers to grab a slice, so bake it up and watch it fly off the platter! You’ll love this scrumptious berry tart. The cream cheese layer tastes light and citrusy, and combined with the crisp pastry and sweet, tangy berries, it’s a heavenly summer dessert! 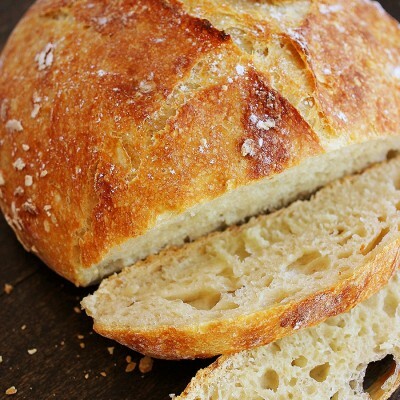 I hope you enjoy this recipe and let me know how it turns out if you do bake it! Preheat the oven to 375 degrees. 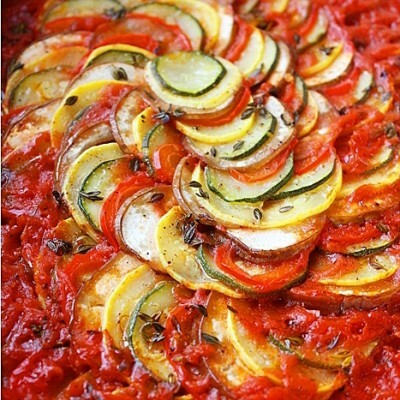 Prepare a large baking sheet with parchment paper or aluminum foil. On a surface lightly dusted with flour, roll out puff pastry slightly and transfer to baking sheet. With a knife, gently trace a 1-inch border around the edge of the puff pastry, careful not to cut all the way through. Brush beaten egg on the outside border and sprinkle with granulated sugar. Bake for 12-14 minutes, or until golden and puffed. Remove from oven. With your hands in oven mitts, gently flatten the center of the pastry. Cool at room temperature for about 20 minutes. While cooling, make the cream cheese mixture. Beat cream cheese with an electric mixer until smooth. Add Cool Whip, lemon zest and 2 Tablespoons powdered sugar, beating again until fluffy and smooth. If pastry is not cooled yet, refrigerate until ready to use. Spread the mixture evenly within the border of the cooled pastry sheet. Arrange your fruit in desired pattern on top of pastry, and sprinkle with remaining 1 Tablespoon powdered sugar. If desired, sprinkle with chopped mint. Slice into 6 squares and serve. Refrigerate leftovers up to 2 days. You can substitute Neufchatel cheese (found next to cream cheese in most grocery stores) with regular cream cheese, if desired. Neufchatel has 1/3 the fat of regular cream cheese but the same texture and taste! You can substitute Cool Whip Lite with regular Cool Whip or 1/4 cup heavy cream, if desired. « Mini Whole Wheat Pesto Caprese Pizzas + Galbani® Mozzarella Caprese Contest! Loving this cute as can be summer tart. Your berries looks so juicy and delicious!! No fuss is always the way to go! I totally prefer the rustic look too! This is so festive and beautiful. And I love that it’s a little lighter! I don’t know that i’d have the patience to turn those berries into a flag either! Honestly, I’d much rather eat it the way it is, with a bit of each berry in every bite. This is gorgeous! No you should not have made a flag design! 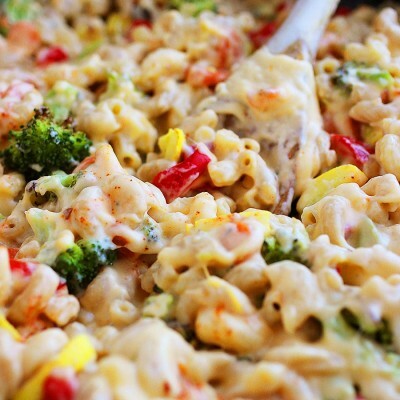 What you have done is much prettier and more delicious looking…..random is good. Lovely tart for summer meals. Your “no-fuss” approach is still gorgeous! Have a great 4th! This is so gorgeous! I’d almost be too sad to ruin it by putting a knife to it…almost! I like that this isn’t a flag cake. It has a much more rustic feel which I love. 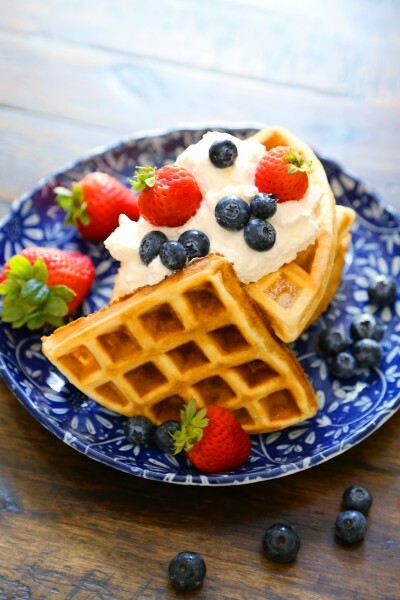 And cream cheese topping with fruit – ahh… heaven! Happy 4th! So perfect! I’m with you – no fuss!! The addition of mint is absolutely perfect here too. Have a great 4th, Georgia! Georgia, this is gorgeous! And just in time for the 4th! Forget Martha Stewart! This tart is perfect just the way it is! Festive and completely gorgeous! Wow, you do a fantastic job of making it sound as easy as pie, really! Great recipe, Georgia! Seriously dying over how gorgeous this is! I want a big ole slice right now! Gorgeous! And, on top of that, it’s easy. Great recipe Georgia. I’m glad you didn’t go Martha Stewart on us :) I think the free form berries are SO pretty! 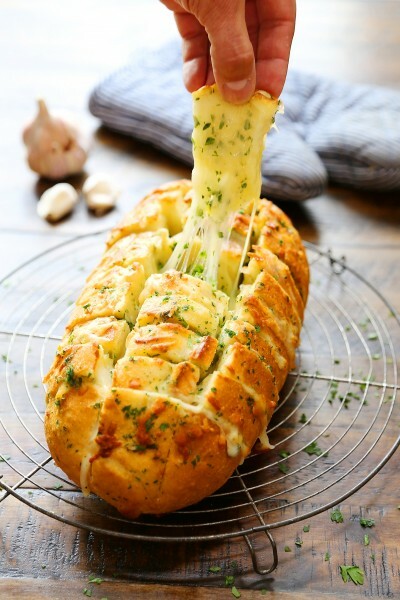 This looks so pretty and tasty! I am a big tart fan so this looks perfect to me! Wow, this looks amazing. This is perfect for 4 of July. 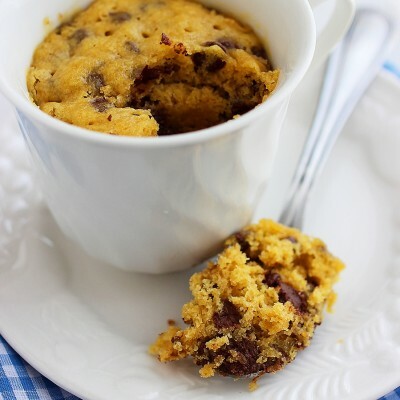 I am not making any desserts lately because it is too hot here and plus I don’t have an oven either :-( I wish I did though because i would totally make this right now. Gorgeous, Georgia! I think this would be perfect for the 4th! I hope you have a great holiday! What a beautiful tart Georgia! Love the how easy it is to put together. Delicious! This tart is absolutely gorgeous, Georgia! Hope you have a great holiday! Yay! Glad you liked it :) I love you addition of the mint – you made this dessert even prettier! Gawwwggeous! I love that it’s so simple too! This looks amazing! I wish I had this for breakfast instead of the bowl of cereal I just had! Georgia – this tart is absolutely beautiful! I love the scattered natural look vs composed any day. Happy 4th! 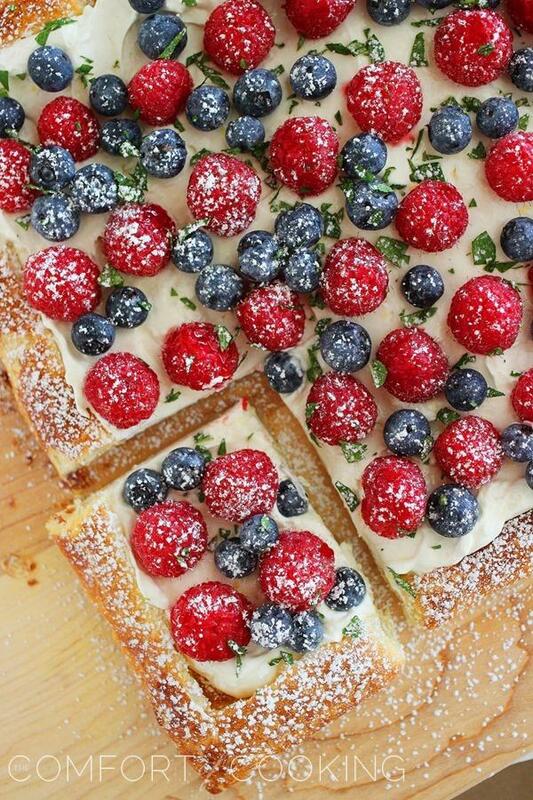 This summer berry tart tart looks absolutely amazing! I love this no fuss method and haha I agree, it all tastes the same anyway :) I still think yours looks gorgeous even with the no fuss method! Have a great 4th of July Georgia! Gosh this is an easy recipe! And looks so great. I have a tough time deciding whether I like raspberries, blackberries, or blueberries best for July berries (and throw late season strawberries into the mix, and it gets even tougher!). I think maybe blueberries, but it’s a close call. 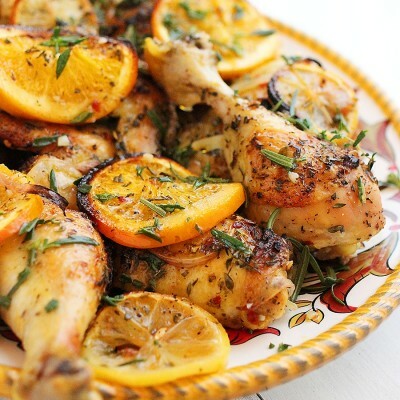 Love the garnish as is – no flag needed! This already screams red, white, and blue – no reason to gild the lily. Good stuff – thanks. This is so pretty, Georgia! I was just thinking about making some kind of fresh-fruit dessert for this weekend. I love this one! Nice and easy (looking) but most of all, beautiful! Your mention of Presecco just makes it complete! Great post. Happy 4th to you!! 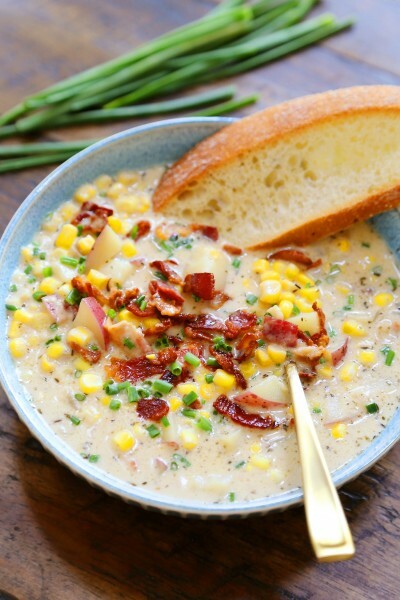 this looks goooooodd… I wish you were my neighbor. Your pictures are stunning! And the dessert looks so delicious and festive! This is such a beautiful looking tart and the best part is how easy you’ve made it. Berries are something everyone in the family enjoys. And it is not just delicious, but very healthy as well. I can’t wait to try this recipe. The photos itself looks really delicious. What a lovely dessert! Your photos are so gorgeous!! Blueberries are my favourite. This tart is fabulous looking. Happy Independence Day to you. Georgia.. What a festive tart!! Beautiful colors!!! The flag has been done so much, it doesn’t need to be done again. If the colors are there, along with deliciousness, that’s all you need. I can tell by looking at this tart that I would love it! So pretty and tempting! A delightful tart. A very pretty and delicious looking tart there. Forget about Martha Stewart’s fashioned tarts. This is too delicious and cute, to boot! How beautiful and festive! I love finding new ways to serve berries! perfect for 4th of July celebrations,light,refreshing and absolutely drool worthy! I’m all about the no-fuss and I think this is just beautiful! What a perfect summer treat! This looks incredible. I think I would try to get away with eating this for every meal if I made it! haha no Martha “perfectness” required, because this tart rocks my world! Looks awesome! Georgia, your presentations always leave me in awe. 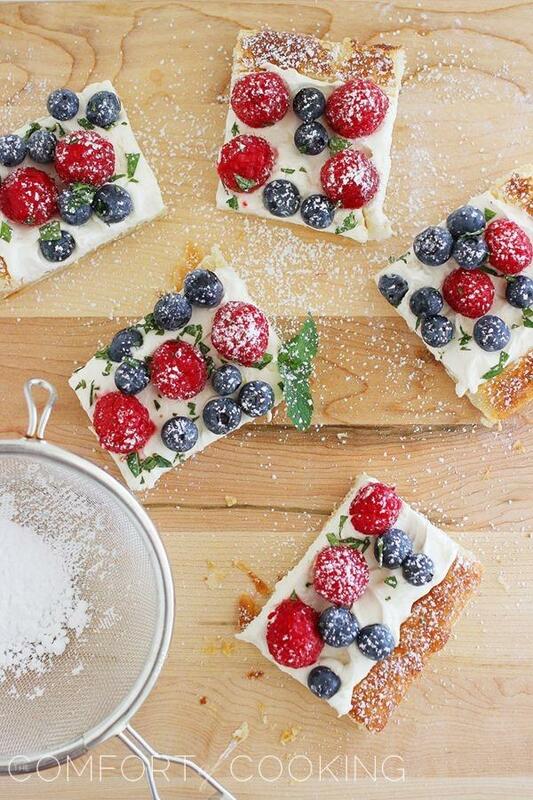 This tart is so beautiful…I don’t think Martha could have done it better…*gasp* yes, I said it. Your dessert is perfection. Dying to try this! I could never pick just ONE favorite berry – they’re all so delicious. This tart is stunning! Amazing! This tart is simply stunning. So light and fresh, I can’t wait to try it. I’ll be including it in my Summer Berry Recipe Round up. the posts are too quick for novices. May you please lengthen them a little from next time? Simply want to say your article is as surprising. The clarity for your submit is simply excellent and that i could assume you are knowledgeable on this subject. I’ve learn some just right stuff here. Certainly worth bookmarking for revisiting. I wonder how a lot attempt you set to make one of these great informative website.